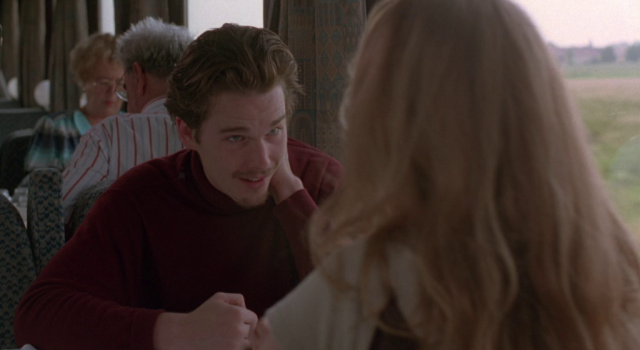 When “Before Sunrise” was released in January of 1995, it came and went in theatres, receiving some acclaim before being relegated to the video shelves, doomed to be forgotten like so many films, without making much of an impact. In reality, however, the film had a bigger impact than people realized. In 1998, the great film critic Pauline Kael listed it as one of the independent films that she enjoyed most in recent years. One online critic called it “the greatest romantic film of all-time.” This film’s co-writer/director, Richard Linklater, brought back the characters of Jesse and Celine for one scene in his groundbreaking film, “Waking Life,” which led to the development of a sequel, “Before Sunset,” that was met with rapturous reviews, and earned an Oscar nomination for Best Adapted Screenplay. 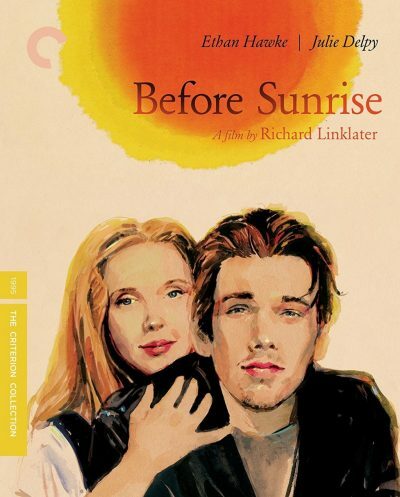 Although I remember hearing about the film back in 1995, I finally watched “Before Sunrise” shortly after “Sunset” was released in 2004. Since then, the movie has been one of the most beloved cinematic love stories I’ve ever watched. 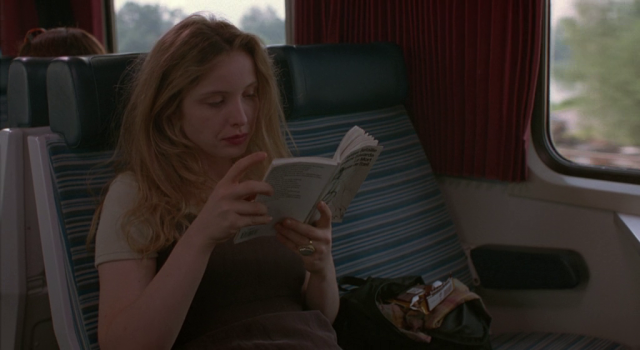 Linklater and Kim Krizan’s screenplay digs deep as we watch Jesse (Ethan Hawke, never better or more riveting) and Celine (Julie Delpy, never more rapturous) walk around Vienna after a chance encounter on a train. Jesse has an evening before catching a flight back to the States, and Celine has to be getting back to France for her classes. A lot can happen in an evening– what do either of them have to lose? That last part is answered more fully in “Before Sunset,” when the characters have lived, loved, and lost more than anyone really does in their 20s, when “Before Sunrise” takes place. The 1995 film reflects that optimism in its story, its setting, and in its intoxicating, intelligent dialogue, which defines the characters not specifically through exposition but in them sharing their philosophies and experiences with the other one. Even if I were just listening to this film, unable to watch the visuals, I would find myself loving the experience, simply because the words and ideas coming out of these people’s mouths are so riveting, and so filled with feeling and passion. The film is so much more than just Jesse and Celine, though. Even without the typical subplots that we find in most romantic films, “Before Sunrise” has plenty going on around its potential lovers to hold our interest. Vienna is like a character in the film, as our protagonists meet a fortune teller; a street poet; come across a belly dancer and a drummer; and go to a carnival, where they go up in the same ferris wheel that once held Orson Welles and Joseph Cotton in “The Third Man,” and they share their first kiss. They go into a church late at night, and though neither are terribly religious, they share a moment of true spirituality, something that isn’t very plausible in most American romances. At the end of their time together, they agree to meet each other again in six months, in Vienna. Whether they do or not, you probably already know, even if you haven’t seen “Before Sunset,” but even though I already know what happened, I love that at the end of this film, the possibilities are limitless for our young lovers, and how, even knowing the “reality” (such as it is in cinema), I love how the truth only enhances the way things play out between Jesse and Celine. All I want to know now is…when will we meet these two again, and where will life take them? Still, if these meetings between Jesse and Celine are the only times we have with them, I can say unequivocally that my life is better for the time I’ve been able to spend with them.